Rituals. My old top; Richmond by club and name. Wanded: nothing to see here. Get around him. First goal. Elton performs. All downhill here from. Kick it to me. 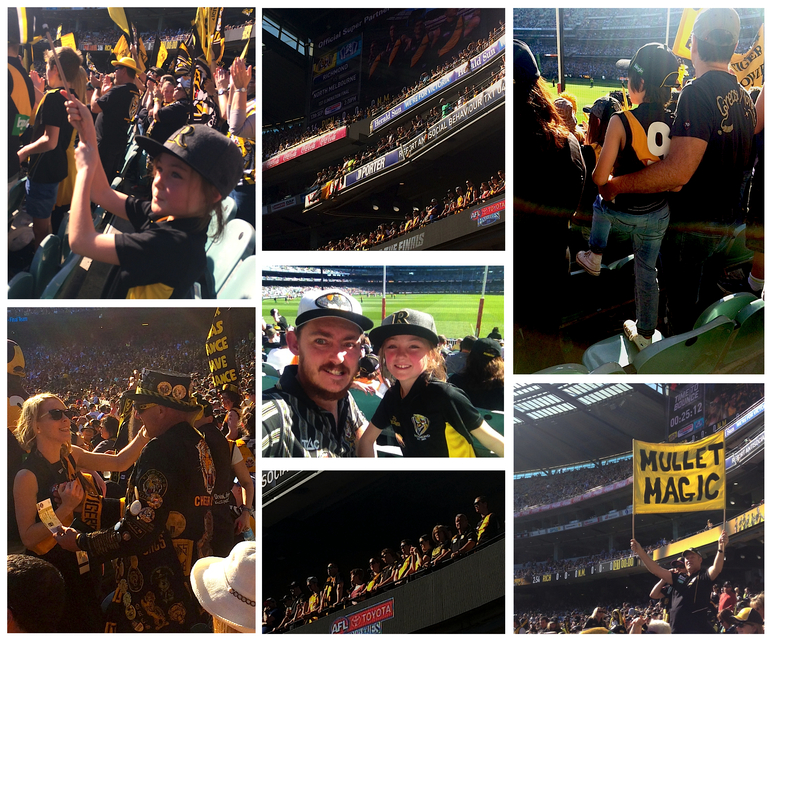 Mog, my grandfather’s knitted head warmer, cousins, family, Jack kicking a goal. Locks. Long faces, the people you meet. Online Tiger royalty. Half time…there’s always next year. Last quarter heroics, none forth coming. Kids watch their last moments of Richmond for the year. 19th century fence, 20th century lights, 21st century stands. Same old Richmond. Last minute push, 9 points short, 20 minutes too late. Reality sets in, this Tiger gig is tough. Tears. The sun sets on 2016. Love of the game wins out. This is where the game began, this is where we regroup and move forward. Footy. Family. Four points missing. Jam doughnuts and kick-to-kick. We’ll be back next year. He could have been chasing. He could have been tackling. He could have been doing a one percenter to get himself involved in the game, help the team out! But no. My brother, though having turned just 10 on this very day, possessed the demeaner of an old time full forward nearing 40 who is past his prime. He appears to be carrying on his shoulders the jaded torture of 10 seasons worth of poor delivery from midfielders, though the little league match actually only lasted 15 minutes. How would this dinosaur fair in todays game of full ground presses and pressure acts? Poorly I feel. But my brother does have a couple of points up on me. Firstly, he played on the MCG. 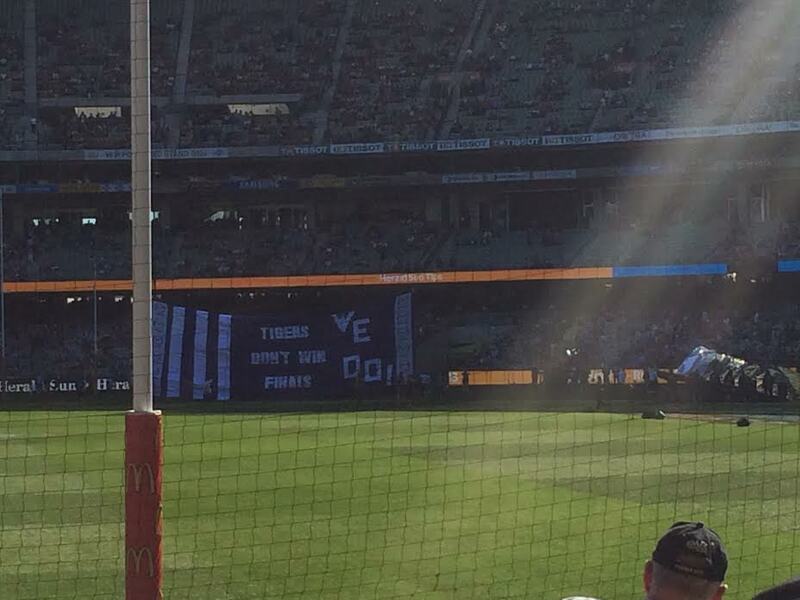 All I got was a grid match at VFL Park and a game at Princes Park. Secondly, he scored North Melbourne’s entire score, 1 behind. 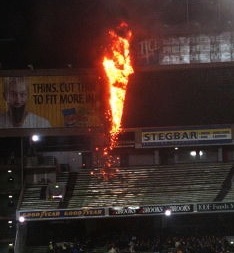 There it is on the MCG scoreboard, thanks to some quick thinking with the camera by mum. For further reading on our little leage and brotherly football adventures, check out THIS post, and THIS ONE TOO! 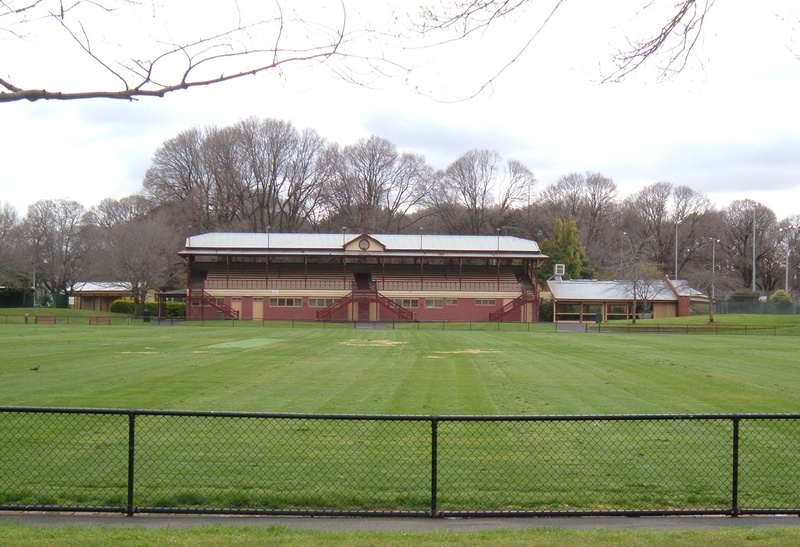 Mention the football clubs Richmond and Carlton and you’ll get the usual response: halcyon days, the late 60’s and 70’s, Balme and Southby, Walls and Sheedy, Doull and Hart, fierce suburban rivals, Percy Jones and TJ…Helen D’amico. That is all well and good, but I’ve only ever read about those ‘good old days’ in books. 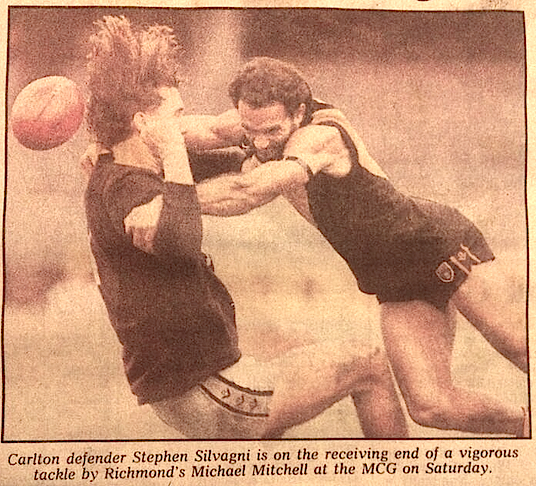 The ‘Richmond v Carlton’ rivalry has been less glamourous yet no less intense in my years of following the yellow and black. I remember that vividly and it still puts a smile on my face. We would often beat Brisbane, St.Kilda and sometimes North, but Carlton? I remember the game well. It was in what I remember as Richmond’s best ‘era’ under Bartlett. Wins against the previous years grand finalist Geelong at Geelong, Sydney and Fitzroy in a 5 week period was unheralded, and the win against Carlton was a ‘back-to-back’ victory. Rare as hens teeth back then. We followed it up with ‘loss, win, loss, win’ pattern to make it 6 wins in 10 weeks. This form was on the back of a young group coming through in Knights, Lambert, Free, Nicholls, Barry Young and the Ryan brothers, ably supported by stalwarts in Flea Weightman, the General, Cloke and Michael Pickering. The nucleus of a promising group which sadly never eventuate as the club’s attentions soon became focussed on keeping itself alive. 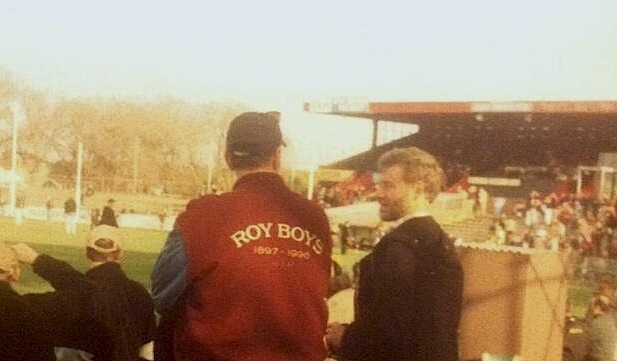 Key to our survival was another Richmond v Carlton match, this time a ‘legends match’ fundraiser played at Windy Hill. Just on 20,000 filled the ground, and as I reflect back as an adult I am tickled pink that I was able to see Hart, Barrott, Bourke, Clay, KB and co run around, albeit a little slower and with a little less hair. Except for KB of course. 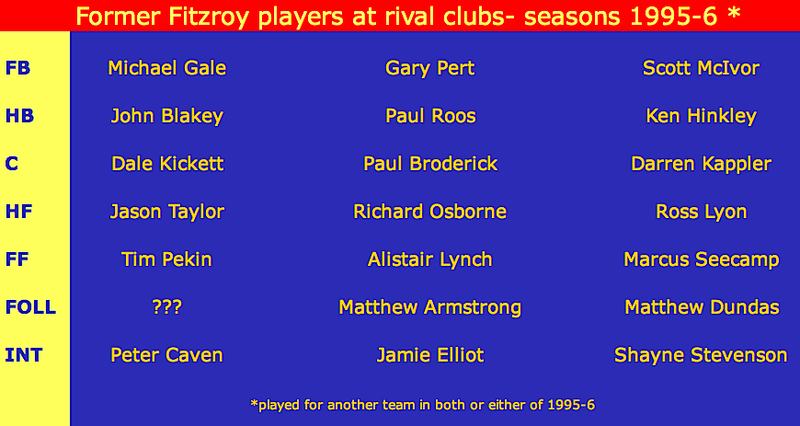 Interestingly, David Cloke played in that match having retired at the end of 1990. He came out of retirement for season 1991 and is possibly the only player to have played in a legends match before the end of his career. His final game in 1991 saw him kick 8 goals and collect the three Brownlow votes in another upset win against, who else, Carlton. 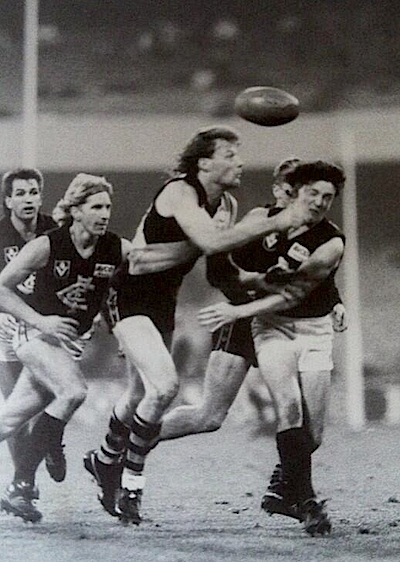 When 1992 rolled around the Tiges again had the pleasure of upsetting the fancied Carlton, sending them from the final 6 with a 3 point win at Waverley Park. Carlton went on to miss the finals by percentage only! Strangely, this was the only occasion our family went to an Essendon game instead of the Richmond, with mum happy to swap her red sash for a yellow one, another closet Richmond fan. I remember a lady with a little radio sitting next to us keeping my updated with the scores once she realised I was a little Richmond devotee. 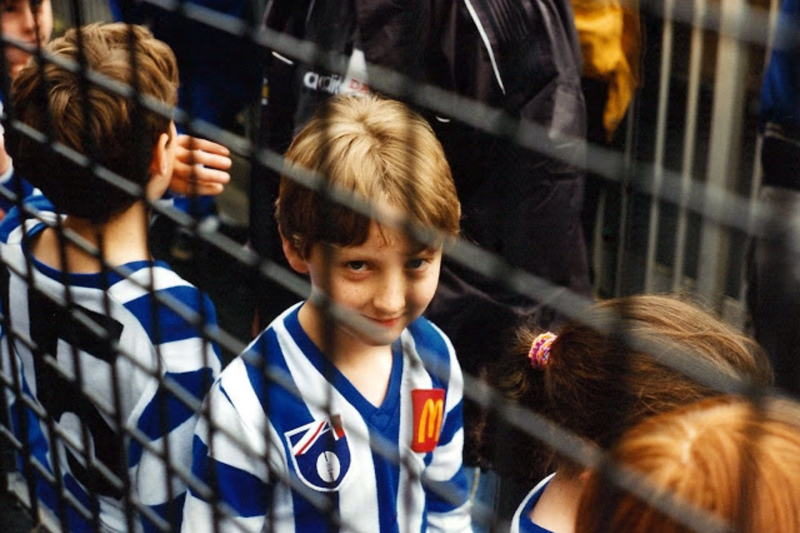 I was at the MCG physically but mentally I was in Mulgrave. The following year, 1995, saw both teams improve to such a point where they met mid-season in a top of the table clash. 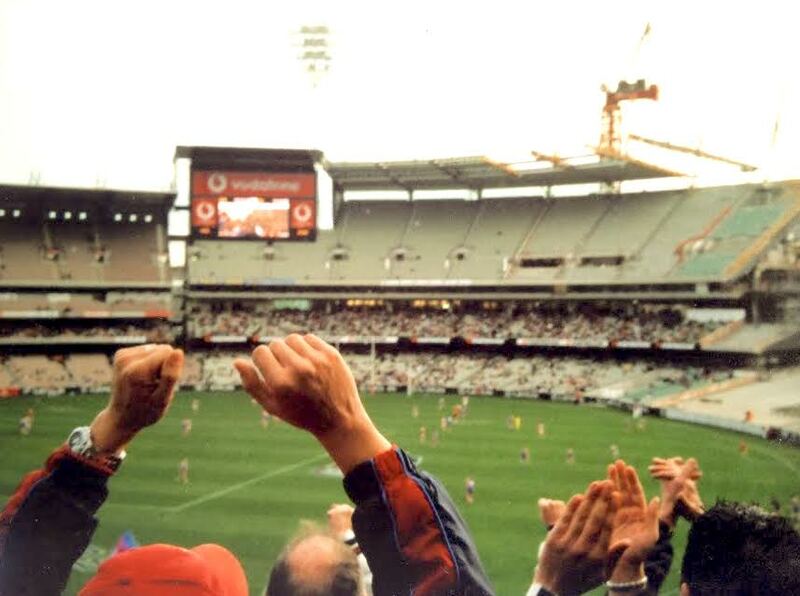 Just two years prior a paltry 6,000 fans attended a Richmond v West Coast match at Princes Park. So the crowd of 84,000 blew this young teens mind, a throwback to ‘the glory days!’ In an enthralling tussle the Blues pulled away late as they steamrolled their way to the premiership. For Richmond, 1995 brought with it a long awaited finals appearance which should have been a foundation for future success. This sadly never eventuated, the club it’s own worst enemy once more as coach Northey left in acrimonious circumstances at season’s end. The Gieschan years were far from glorious, however when he replaced ‘Carlton man’ Robert Walls as the Tigers caretaker coach in 1997, he propelled us to a series of late season wins, amongst them one of my favourite matches of all time. 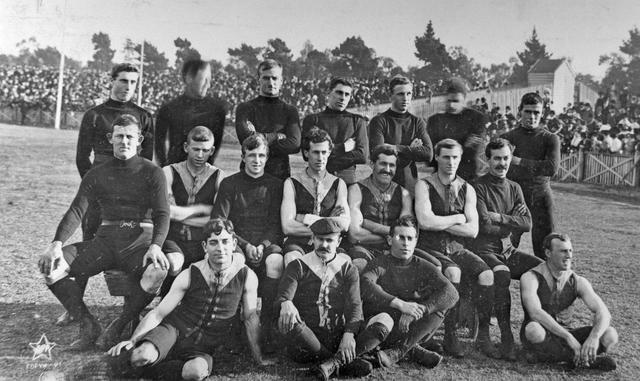 In keeping with the theme, this time it was Carlton who simply had to defeat Richmond on their home turf to advance through to the finals. 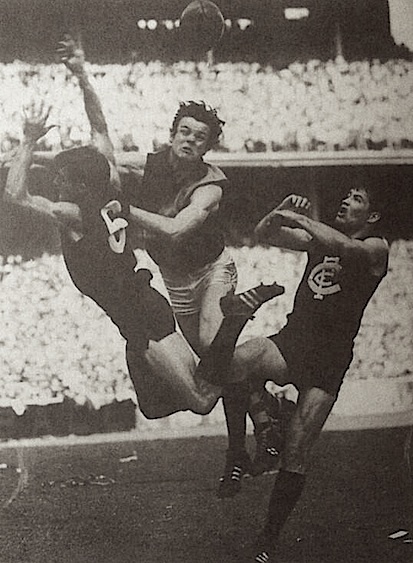 In the last truly ‘suburban battle,’ 35,000 fans crammed into the old ground to see Carlton jump out to a 40 plus point lead. I still pull the old video out every now and then and force myself to watch the first half. It makes watching the second half all the more enjoyable, especially as the commentators turn to talking about Carlton’s finals opponent the next week. What ensued was a last man standing, nail-biting comeback in which former Blue Ben Harrison kicked the winning goal! 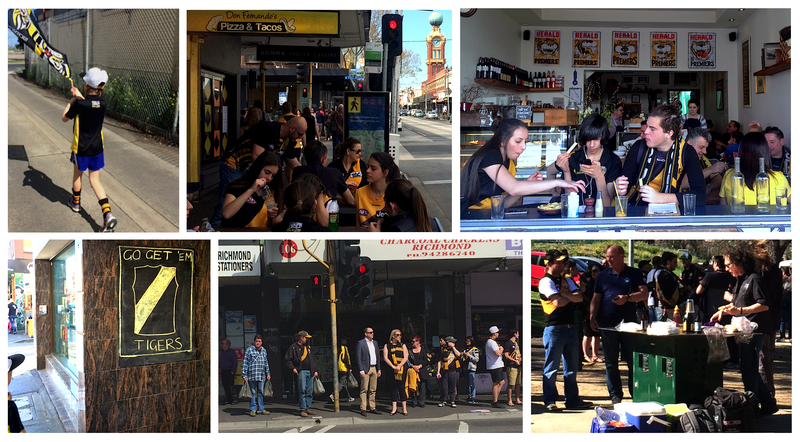 Tiges by 2 points with the loudest ‘away cheer’ you’re likely to hear upon the final siren. Whilst we finished a lowly 13th, dragging Carlton down with us at the death presented great satisfaction. Fast forward to the final match of 1999 and the Giesh had been well and truly unleashed (let go) by Richmond and would soon surface as coach of the umpires! 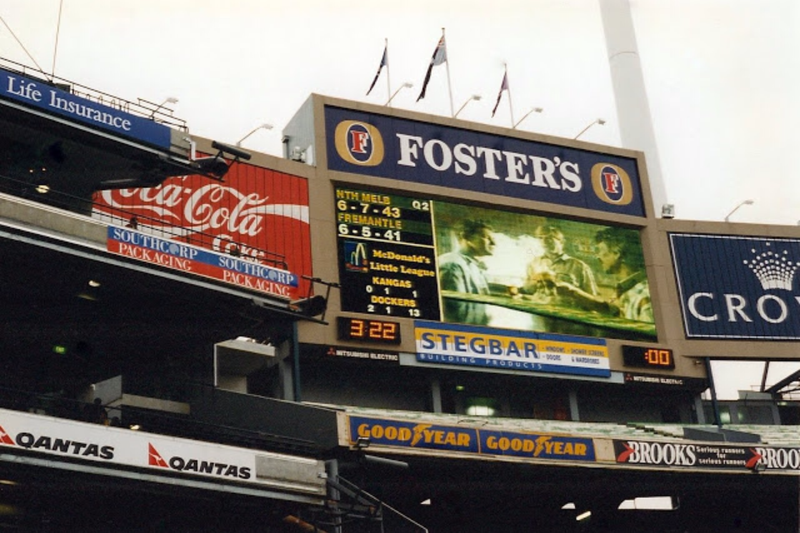 The Blues were grand final bound whilst the Tigers were enduring another mediocre season, but in the spirit of this rivalry as I’ve followed it in my lifetime, the underdogs got up, although the game will forever be remembered as the ‘scoreboard fire’ match! 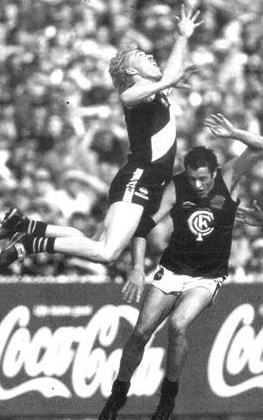 The final round of 1997 was soon evened up by the Blues, as in 2000 they thwarted Richmond’s attempt at a finals birth, again in the final home and away match of the season. The Tigers needed to beat Carlton to make it, with little percentage separating the Tiges from 8th place Hawthorn. The Tiges lost. The Tiges finished 9th. Again. It took only a year for Richmond to exact revenge and this time in a footy match with meaning. Just as the teams will compete tomorrow, Richmond versed Carlton in a tough and scrappy 2nd semi-final in front of 83,000 fans. 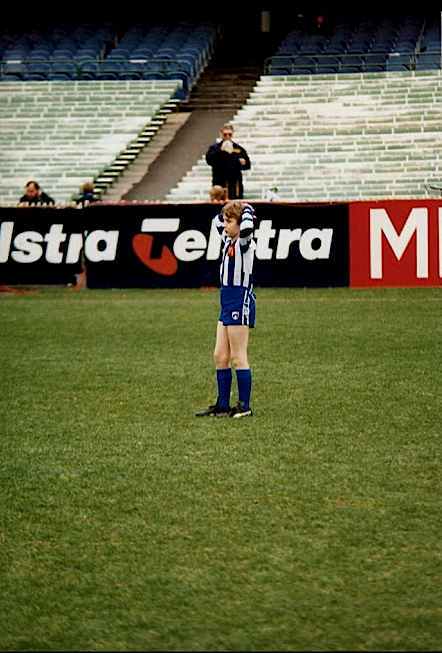 It was a sweet victory, the only finals win that Matthew Richardson and Joel Bowden would enjoy, whilst David Bourke was lucky enough to play also in the 1995 semi-final win against Essendon. 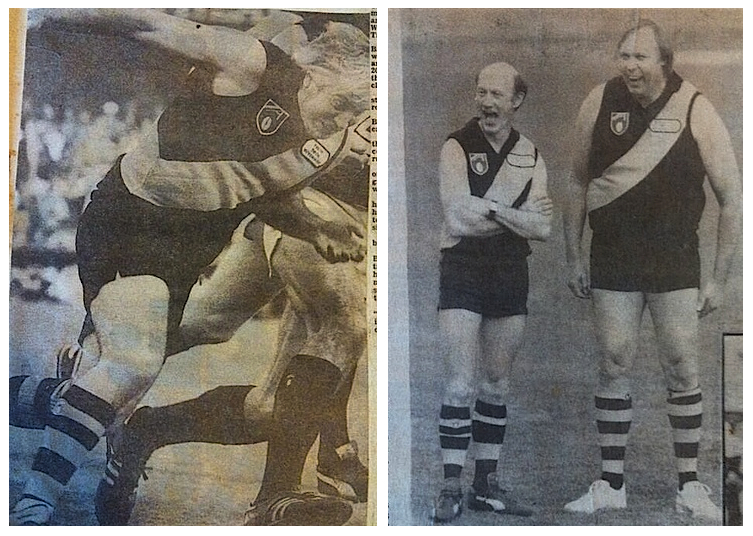 Their fathers won 7 Tiger premierships between them. Rory Hilton gets his big bum off the ground in his most important game for Richmond! Kicked the sealer! However 2001 proved to be false dawn for a number of teams, and the two old ricals plummeted down the ladder to finish in the bottom 3. Both clubs have been slowly trying to claw back ever since. Richmond landed a large blow in 2005 under new coach Wallace, handing Carlton a near 100 point thumping in a false dawn of grand proportions. Then Nathan Brown broke his leg and Plough’s tenure headed steadily south. A brutal blow was handed by Carlton to Richmond in the much-hyped ‘Ben Cousins’ match, where Richmond fans displayed how desperate they were for anything that could be claimed as a success. Pitted in front of a full MCG it was billed as the biggest build up to a non-finals match the game had seen. Carlton smashed the Tiges in demoralising fashion and I clearly remember a Carlton supporter behind me bellowing “Time for another 5 year plan Richmond!” It hurt because I knew it was true. That’s why I’m not looking forward to Sunday. 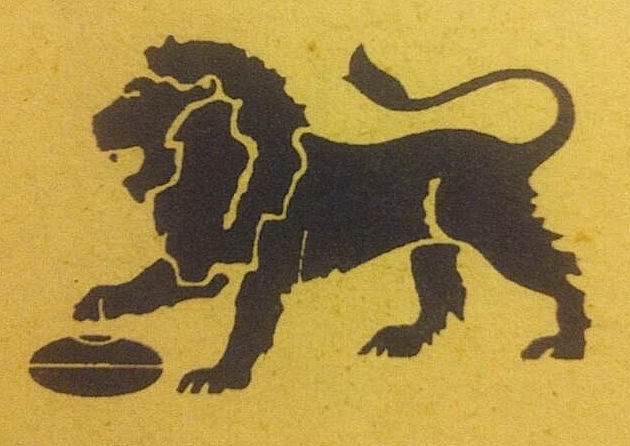 The two most recent blows handed to Richmond have actually come from the club formerly know as the Preston Bullants. Not once, but twice in the past 12 months a severely undermanned Carlton have beaten the more fancied Tigers, who in both instances had the match seemingly in their keeping. The fragility of Richmond on display for all to see. While last years loss, compounded with a loss against the Suns from another ‘unlosable’ position, saw us again miss out on finals action, this year’s loss to an undermanned Carlton fortunately was not enough to knock us out of finals contention. However the Blues still get their chance on Sunday, as do the Tigers for redemption. I haven’t enjoyed this week to be honest. A loss to ‘ninth’ placed Carlton would be the ultimate insult and irony given the wretched run with ‘ninth’ Carlton inflicted upon Richmond way back in 1994. It’s also ironic that when we finally did make the finals, the 9th team also qualified due to Essendon’s disqualification. Anyway, I’ll be anxiously watching on from level two of the Olympic stand with my keen six year old daughter beside me, the same spot my dad stood to watch the Tigers beat the Blues in 1969. Here’s to shaking off the shackles of failure, but my lid is still firm shut.